A special meeting to decide whether the construction of a controversial dam on the Mekong River in Laos should be allowed has ended without agreement. Delegates from Laos, Cambodia, Thailand and Vietnam said a decision should be made at ministerial level. The hydro power project at Xayaburi would be the first to be built on the mainstream of the lower Mekong. There are concerns over fish stocks and the consequences for millions of people whose livelihoods depend on them. Laos is hoping to become "the battery of South East Asia" by using its rivers to generate electricity for export - the majority to Thailand - thereby gaining income to develop the country. Its representative insisted that the consultation process for the Xayaburi Dam was complete and there was no reason to delay construction. But the proposed $3.5bn (£2.15bn) Xayaburi dam and power station met opposition from neighbouring countries, who share downstream waters. The four countries of the Mekong River Commission were unable to find a common conclusion at a meeting in the Lao capital Vientiane. There was "still a difference in views" over the project, the commission said in a statement. Cambodia said there were "gaps in technical requirements" and there should be a "comprehensive study" of the possible impact of the dam on countries downstream. Cambodia is planning mainstream Mekong dams of its own and many more have been proposed in Laos. Opponents fear the Xayaburi dam would open the door to a building spree, degrading the river's fragile ecology and associated fishing industries. An earlier report by the commission had suggested a 10-year moratorium on construction. That report was been backed by community organisations who are suggesting alternative ways of generating electricity. In Cambodia, fishing communities are worried that they might see a disastrous decline in stocks, says the BBC's Guy De Launey in Phnom Penh. Sen Salim lives in a fishing community on the outskirts of Phnom Penh. "This river is very important - when there are many fish it helps us to make a better living. When there are fewer fish it is bad for us," he told the BBC. "If they made a dam in the big river, it would block the water flow - then the fish wouldn't be able to get through to migrate and breed." It is seen as a matter of national importance, our correspondent says. 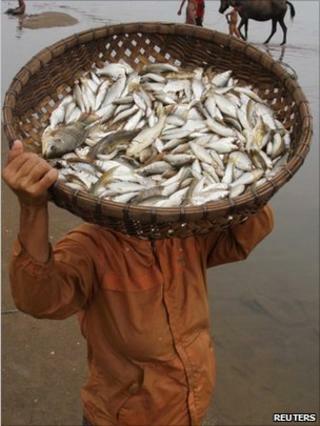 Fish provide about four-fifths of the average Cambodian's protein intake, and millions of people rely on the Mekong for their livelihoods. World Wildlife Fund says the consequences of mainstream dams have not been studied properly.